Today, over 500 social prescribing-link workers are making the most of their membership and increasing positive wellbeing outcomes for themselves, individuals and communities. The courses have given me a good understanding of the role of a link worker and a holistic view of the process with tools to be more efficient in the role. The group is really beneficial to me for networking, learning and sharing ideas with other link workers. As I am new to the link working role, I found it all useful. Glad i signed up. 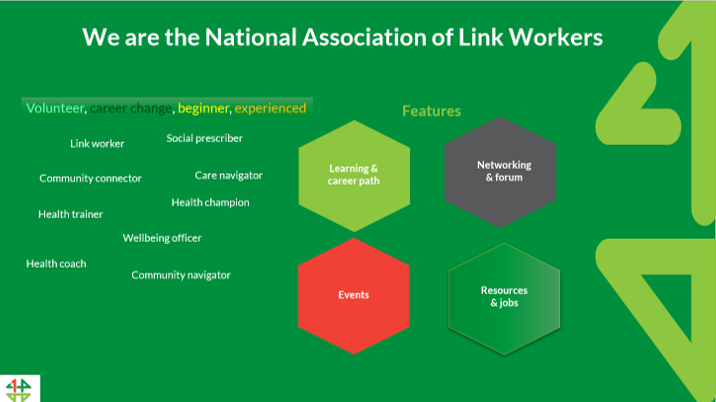 Our flagship courses are accredited by us 'The National Association of Link Workers'. It counts towards the link working workforce evidence of continuous professional development.